The pronouncements of Niki Lauda always amuse me. No matter what the story, the F1 journalist can rely upon Niki for a viewpoint and it's usually a dubious one. His latest foray as the expert with all the answers is stranger than most, however. Dear old Niki thinks that, if the idea of racing without traction control scares the drivers, "they need to go back to driving school." Fair enough - that's an opinion held by many in the racing fraternity, I'm sure. But it does seem odd for Lauda to be in that camp. Isn't this the guy who pulled out of the 1976 Japanese GP, saying that the track was so wet that it was dangerous to continue (and thereby allowing James Hunt the chance to come from behind and take the championship)? It seems a bit unfair for him to throw stones at today's drivers when he withdrew from a race for exactly the reason that concerns the GPDA. I don't recall any of the present drivers refusing to race at Fuji last year, when the weather was actually worse than it was in 1976. Does that mean that Niki is the wimp? What Lauda is (probably deliberately) missing is that those drivers who question the ban on TC do so because they feel that it will make driving in the wet more dangerous. They have no problem with the idea otherwise; in fact, their leader, David Coulthard, has said that he enjoys driving without TC. They are merely making a fairly obvious point - that it will be easier to make a mistake when the track is wet and there is no TC to control wheelspin. It's a reasonable point of view. So Lauda's statement is not a sensible contribution to the debate and it would be better if he held his tongue. But I suppose that would rob F1 of one of its sources of entertainment - as I mentioned before, he is always good for a laugh. My own opinion is that the drivers have raced without TC before and should have no problems with it this time. I suspect that the GPDA is just making its presence known and covering itself in case there is a really serious accident in a wet race this season. At least then they will be able to say that they told us so. But that is no reason to suggest they should go back to driving school. Insults are never very helpful in a serious debate. 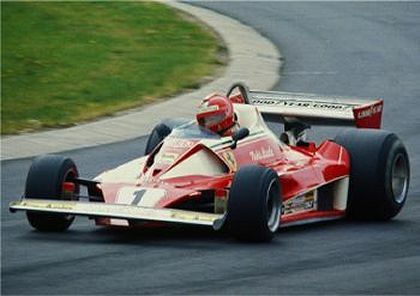 Lauda withdrew from the Fuji race because of visibility not grip or traction. The guy nearly died a few weeks earlier. 6 weeks after being given the last rites he is back racing with blood pouring out of open wounds in his head. Go read a description of him taking off his balaclava after the Monza race and say he is a wimp. Lauda is not the only driver to have done so. Several other drivers withdrew from that same race and Prost did it at a later race. Someone asked Prost if he was ashamed about not racing and he said no but he was ashamed that he had raced in similar circumstances before. Driving without taction control should not prove especially difficult for any half decent driver so to an extent Niki is right. However the problem I have with DC's comments is not that he questions the lack of traction control it is that someone who is probably the most sensible and level-headed GP driver around thinks it is OK to drive F1 cars in a monsoon. It is not! If you cannot see you are not safe. Would they ask the drivers to race in thick fog? Of course not so what is the diffence between a wall of water created by nature and one created byt racing cars. The human eye can only tell that it can't see though either. How many times do we need to see a car plough into the back of another because the driver didn't know it was there before they ban F1 cars running in severe wet conditions. If there was ice on the track and no grip whatsoever they can race but not when visibility is zero. In fact, I was not calling Lauda a wimp at all, Steven. I know the horrendous injuries he suffered in the crash at the NUrburgring and it is no wimp who returns to racing so soon after such an experience. What I was saying was that he should remember that year and not imply that others are wimps for having concerns about safety in wet races without TC. Surely anything that makes wet races a little less dangerous deserves at least a discussion before being thrown away? And Lauda does not help that discussion by suggesting the GPDA go back to driving school. As regards the lack of visibility in wet races, what you say is absolutely true and it has always been so. Severe weather conditions such as affected Fuji last year should cause the cancellation or rescheduling of the GP - but the FIA do not agree and so there will continue to be races in which the drivers cannot see a thing. I agree that DC's attitude seems a bit illogical in that he will race when visibility is non-existent but has doubts about the loss of TC. I can only suppose that he knows the FIA will do nothing about stopping GPs in severe weather, so any protest is bound to fail, but wants to retain TC for such conditions because it helps a little. Lauda's decision not ot race a Fuji was one of the most courageous decisions a racing driver has ever made and let us not forget that the cars in those days would fall apart if they went round a corner too quickly. I agree with Lauda they should get on with it. i'm sure if that 76 fuji race had been before his accident,lauda would have driven on,his eyes were bothering him,with all that spray coming thru his visor. lauda was braver than most,coming back from the dead. i don't agree often with you clive but i'a afraid the award for the strangest remark has to go to you. sorry that should be,i don't often disagree with you! It would be a boring world if we all agreed with each other all the time, Rob! But I was being ironic and not calling Lauda a wimp at all. By pointing out that his reasoning must mean that he is a wimp as well, I was merely showing how ridiculous his reasoning is - it is clearly not true that he is a wimp. I agree that the drivers are being unnecessarily cautious in their approach to the ban on TC but they have made a valid point and I think it deserves to be answered. I'm not sure how much reasoning there was to the remark-or how much there should be. He's a retired racing driver not a reigning head of state. It's the sort of off the cuff remark people make. If it were Max or Bernie, yeh, cry foul they're supposed to be above that but are we really attributing this kind of weight to quips these days? Hmmm. Political correctness is really out of hand. I figure, if it's important enough for someone to write a news article about, it's worth me commenting on!